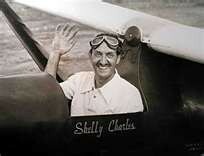 J. Shelly Charles was an airline pilot with a few million miles under his belt. He retired from Eastern Airlines in 1957 after 27 years with that airline. But he was also a soaring pilot - not just any soaring pilot - he was the second American to earn a Diamond Badge - and the fourth in the world. Captain Charles, or "Shelly" as he is known, became involved in flying about 1921, shortly after World War One. His flying included racing and stunt flying as well as his airline job which he began about 1930. He had been exposed to soaring with a few hops in an old primary around 1929. 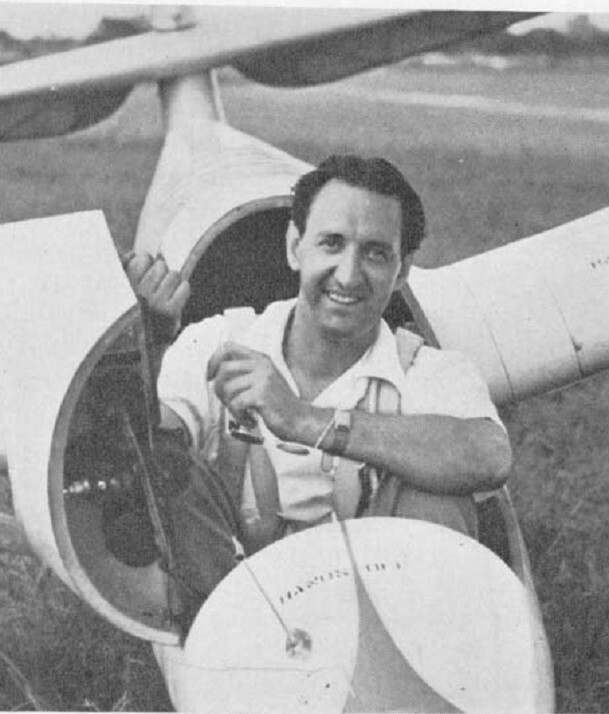 It took ten years for him to get serious about the sport and in 1938 he purchased and built, in six months time, a Bowlus Baby Albatross sailplane which he successfully test flew in May of 1939. He must have enjoyed the experience because he then acquired a German-built "Minimoa" sailplane formerly belonging to National Soaring Champion, Chet Decker. "Nowhere else is there the exhilarating sensation of sweeping, silent flight; for so long the exclusive prerogative of the birds. Without question, there is no comparable phase of powered flying, so let him reconsider who has flown every type of airplane; the sailplane, so often looked upon with scorn by pilots, can still give him a thrill!" "It is the spirit of friendly cooperation which is developed by the group of fellows who get together for a week-end of soaring; a spirit that makes light work of tedious downwind retrieval, or repairs a balky tow car in the field-that asks no more reward than to see a lucky pilot contact a thermal and be carried up and away, even though it will take all night to get him!" Shelly had some interesting experiences in the sport. 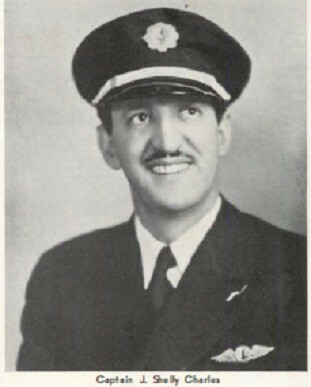 In January of 1941 he took his sailplane down to an air meet in Miami to do some exhibition flying. He had been soaring for about two and one half years and already won several prizes and many honors in this field. He was the American Open Soaring Champion and Vice-President of The Soaring Society of America. The Miami Air Maneuvers Association had asked him to put on a soaring and acrobatic exhibition for three days and he wanted to explore thermal soaring at Miami. After being towed to about 3,500 feet and planning to stunt down to a low level and land, he encountered so many good thermals that he was reluctant to come down. So stayed up fifteen minutes over his scheduled time and did not land until an aerial bomb reminded him. Turns out the Duke of Windsor had arrived and had to circle ten minutes until Shelly landed! After landing, he was told that the Duke had requested another exhibition but wanted to talk to him before he went up again. Shelly apologized to the Duke for keeping him circling but the Duke was more interested in talking about the Minimoa sailplane and soaring in general. On July 18, 1943, Shelly Charles, seeking gold altitude gain, set a national altitude record of 19,434 feet at Atlanta, GA flying the Minimoa and utilizing well developed cumulus clouds. The flight, much of it within the cloud on instruments, included heavy turbulence, icing and strong lift - and, he was flying without oxygen. A quote from Shelly - "Riding a storm as big as this one, with only a bank and turn and compass to rely on is simply foolishness. I found out the next day that crops where the storm passed over were damaged by hail, and I knew that when I encountered such heavy rain at the start, I was in for a dandy ride, but there was nothing I could do about it. In the future I hope to have some arrangement for heating the pitot tube for the prevention of ice, as well as some arrangement for oxygen. I may never need them, but you can never tell." 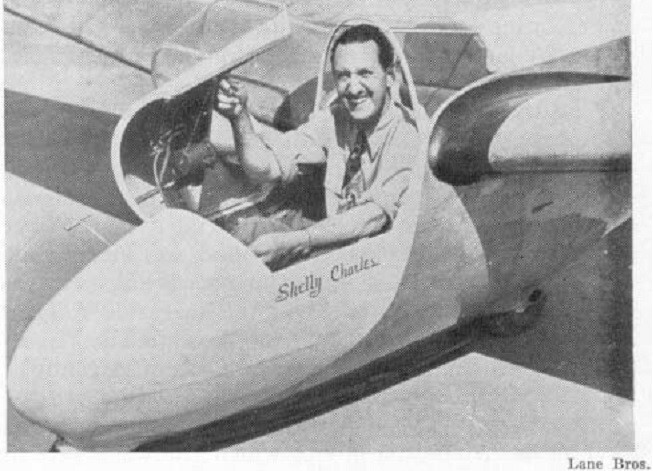 Shelly made a 350 mile flight at the Odessa Records Camp, August 3, 1951, flying his Weihe sailplane and completing his Diamond Badge #2 (#4 in the world). J. Shelly Charles earned Silver #35 in 1940, Gold #14 in 1947 and Diamond #2 (Intl # 4) in 1951.